You will need Node 6+ installed on your machine. Some experience of React will be helpful. 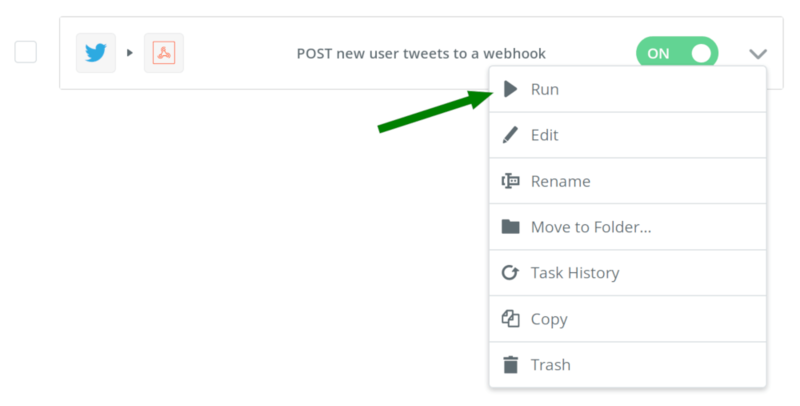 In this tutorial, we’ll explore how Pusher Channels can be used in conjunction with Zapier to display updates to a user’s Twitter feed on a webpage. If you want to play around with the code as you read this tutorial, visit this GitHub repository which contains the final version of the code for you to check out and run locally. Prior experience with building React and Node.js applications is required to complete this tutorial, but you don’t need to know how to use Pusher Channels. You also need to have Node.js (version 6 and later) as well as npm (version 5 or later) installed on your machine. You can use the commands node -v and npm -v to see which versions of Node and npm you have installed. Create a new folder for this project in your filesystem. You can call it tweet-stream or any other name that you prefer. Open a new terminal window and cd into the new directory you just created, then run npm init -y to initialize the project with a package.json file. Once the installation completes, create the following files in the root of your project directory: server.js and variables.env. Before we can utilize the features of Pusher Channels in our application, we need to sign up for a free Pusher account. Once your account is created, select Channels apps on the sidebar, and hit Create Channels app to create a new app. Retrieve your credentials from the API Keys tab, and then add the following to the variable.env file you just created. As you can see, we’ve set up just the one route where new tweets will be posted to. For now we’re just logging the request body to the console, but we’ll revisit this section in the later parts of the tutorial. You can start the server by running node server.js in the terminal. It should now be running on port 5000. Zapier is a service that allows you to integrate between several applications. 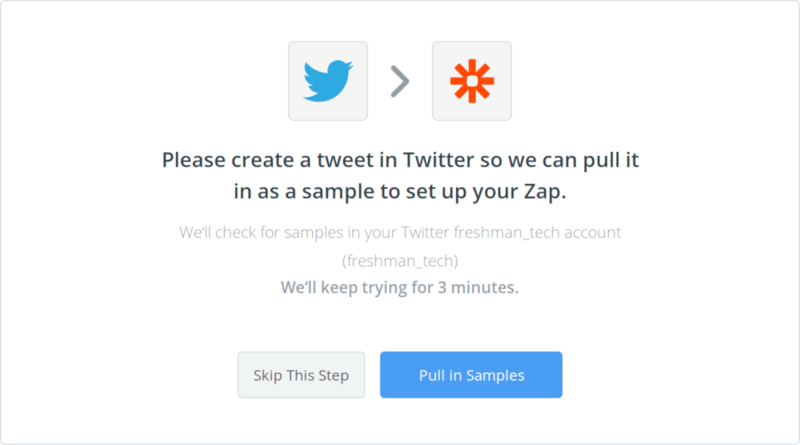 To use Zapier, you need to sign up for an account. Once your account is created, go here and click the Make a Zap! button to create your first Zap. Under Choose a Trigger App, select Twitter and choose User Tweet under Twitter Trigger. Hit the Continue button to move on to the next step. Connect a Twitter account that will be used for this Zap. You can use your existing Twitter account, or create a new one if you prefer. Once you have connected account, select it and hit Save + Continue. 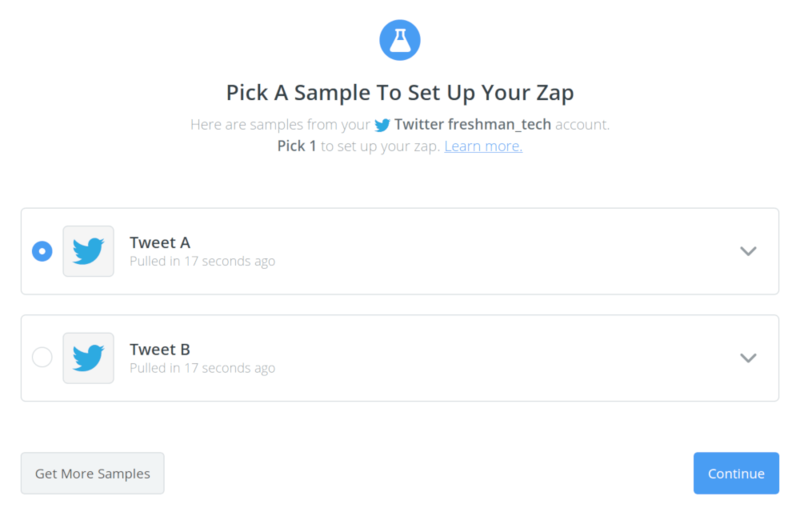 On the screen that says Pick A Sample To Set Up Your Zap, before you click Pull in Samples, make sure there is a recent enough tweet on the account you set up. Otherwise, send a tweet out before clicking the button. You should see the following screen once a sample tweet has been pulled from your Twitter account. Just hit the Continue button. You need to setup an action step. Click the link highlighted in the screenshot below to add an action app. 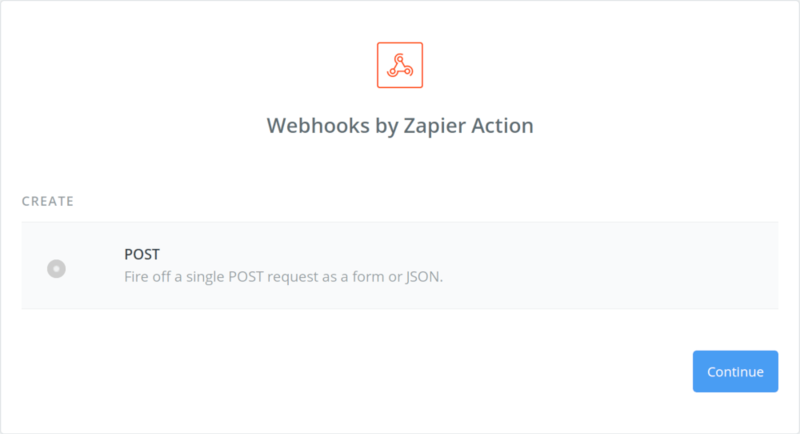 Under Choose an Action app select Webhooks by Zapier Action, then select POST under the CREATE heading and click the Continue button. 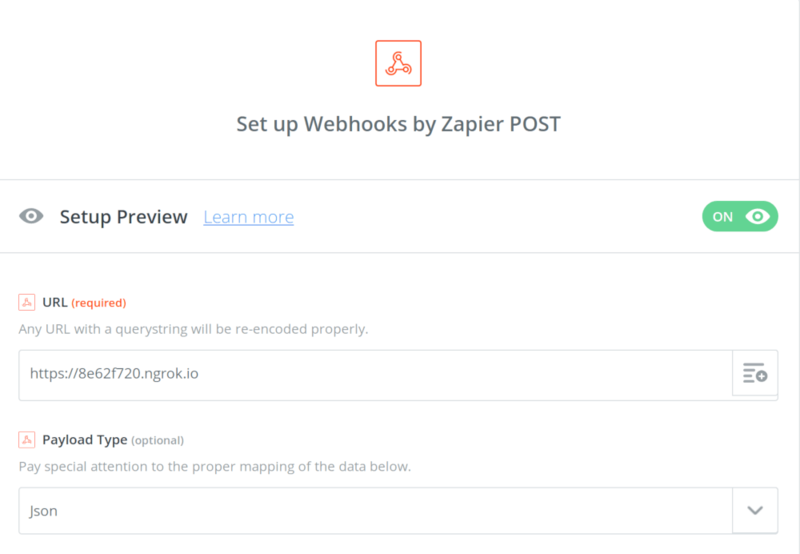 You will be asked to provided a URL under Set up Webhooks by Zapier POST. 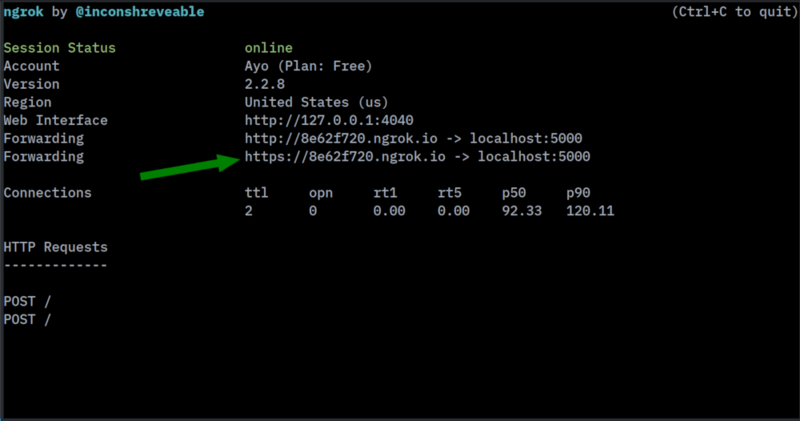 Copy the URL received from ngrok into the input field. Under advanced options, set the Payload type to Json then hit the Continue button. On the next page, hit Send Test to Webhook by Zapier. This will send a post request to your local server along with the payload of the sample tweet pulled in earlier in the request body. Check the terminal window where the server is running. You should see some JSON output in the terminal. Finally, hit Skip test on the left hand side and Finish on the right. You will be redirected to a page confirming the successful setup of your first Zap. The 15 minute interval is a limitation of Zapier’s free and entry level plans. With a paid plan, you can take it to as low as 5 minutes. Next, cd in to your project directory and run create-react-app client to create a new React app in a new directory called client. Once the installation process completes, cd into the newly created client directory and run yarn start to start the development server. The application will be available for you to view it at http://localhost:3000. Launch another terminal window, and cd into the client directory. Then run the following command to install the other dependencies we’ll be using to build the React app. 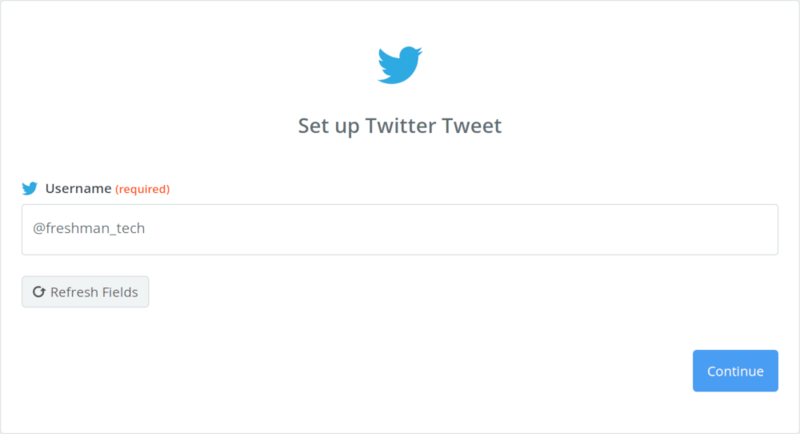 The componentDidMount() lifecycle method houses the logic for displaying new tweets on the page. We’re opening a connection to Channels using the subscribe() method which allows us to subscribe to a new channel called tweets. Then, we listen for the new-tweet event on the tweets channel using the bind method and update the application state once we receive a tweet update. Don’t forget to retrieve your Channels credentials from the API Keys tab in the dashboard, and then replace the <your app key> and <your app cluster> placeholders in App.js with the appropriate values. Zapier will hit this route for each new tweet that is posted to the Twitter account you connected, and include the tweet payload in the request body. We can then trigger a new update on the tweets channel with the tweet payload included. Kill the server using Ctrl-C and run node server.js again from the root of your project directory. Then send a few tweets using your Twitter account. After about 15 minutes, you should see the new tweets on the page. 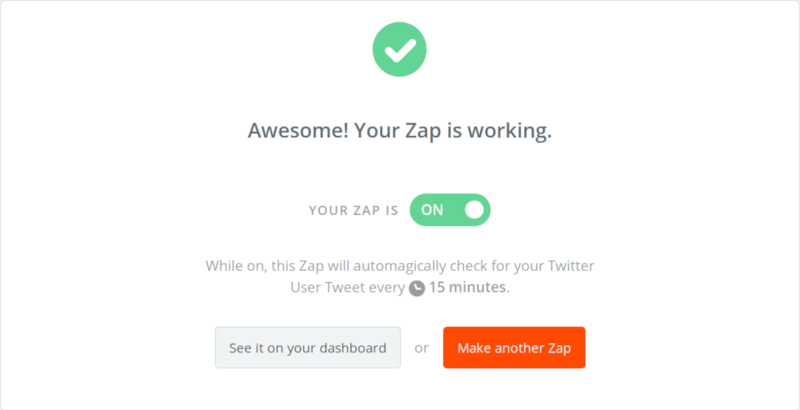 You can also trigger the update manually by going to the Zapier dashboard, find the Zap you created and hit the Run button as shown the screenshot above. I have explained how to set up Zapier to get fetch user tweets every 15 minutes and how to display new updates on a webpage with Pusher Channels. If you want to dig into other things you can do with Channels, make sure to check out its exhaustive documentation. To grab the complete code used in this tutorial, please visit this GitHub repository.